This year's version of the Year of the Monkey stamps were designed by Albert Ng and Linna Xu. The domestic stamp 'depicts a golden figure that is vibrant and alive against a rich red background that provides a stark and striking contrast, while the international-rate stamp features a stylized Monkey King mask with red and gold accents'. 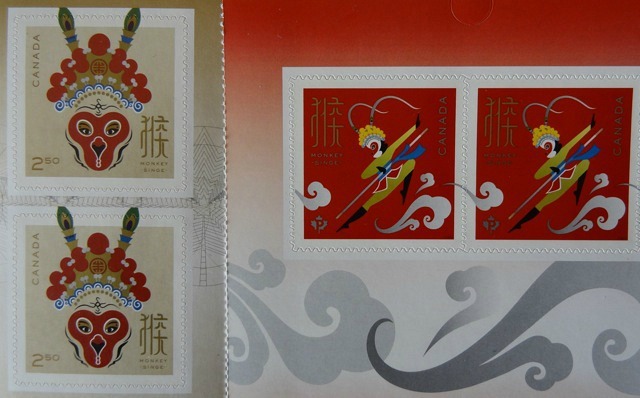 The stamps were inspired by the legend of the Monkey King, also known as Sun Wukong, one of the main characters in the classic Chinese novel Journey to the West. The story tells of how the monkey king accompanied the monk Xuanzang on a journey to India to retrieve sacred Buddhist texts known as sutras. For some reason there was a long delay with getting these stamps into the post offices, but finally, they are available. I think they look better when you see the actual stamps, but this design is not a favourite. It does, however, feature the colour red. Very creative Chinese New Year stamps this year! The main feature of this year's American stamps are peonies. Meh. Great stamps for the year of the monkey. I think red is associated with good luck for the new year, isn't it? So I thought of Chinese stamps for today, but I had too many hearts to be shown! I pleased that we got some Chinese New Year stamps today. These are definitely eye catching. Those are beautiful - very colorful. Creative and colorful! Love them.